In the check-out line with other beat-the-storm shoppers, my eyes surreptitiously glanced past Miley’s scandals, Bieber’s drug busts, and Ellen’s cancer shocker1, when smile-squinted eyes arrested my no-longer-clandestine perusal. At first, ashamed to have been caught reading tawdry headlines, I looked away, pretending that I had seen nothing extraordinary. But the open, friendly face drew me back. 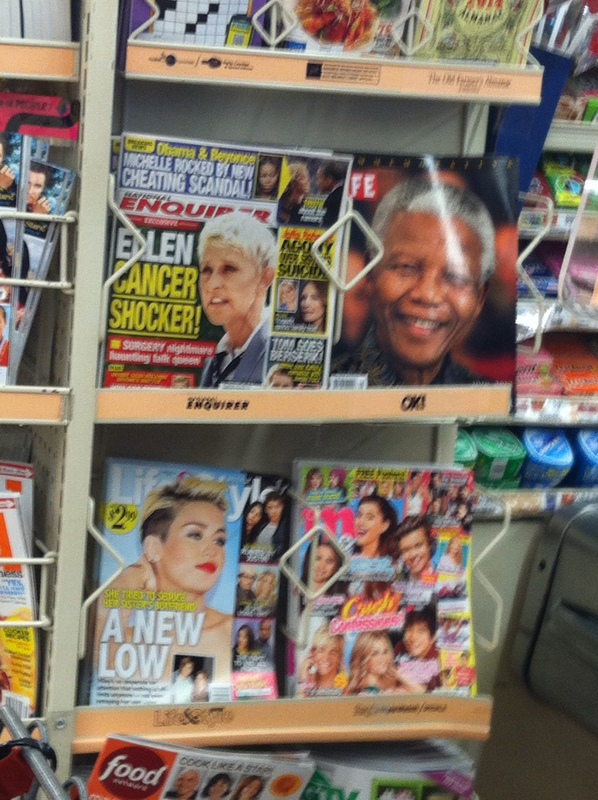 Wondering what is Nelson Mandela doing on the tabloid shelf? I openly turned back. The red and white LIFE logo and the word ‘commemorative’ gave the magazine a respectability lacking in the other periodicals. I reached out with pride and rescued Nelson Mandela from his distasteful surroundings. Angered by the grocery store’s treatment of LIFE magazine’s commemorative of Nelson Mandela, a new blog was born. Yes, I thought: I will write about this great man being relegated to Inquirer status. I snapped a photo and marched off, full of myself, and ready to write an article about using talent and wasted talent and how Nelson Mandela’s talent changed his world. I’d get to write about the Parable of the Talents (Matthew 25:14-30) and encourage all who read my blog to allow their talents to make the world a better place. It would be a great article written at the expense of the Miley’s, Bieber’s, and Ellen’s of the world. My idea started to unravel on the drive home. Did I just see Ellen’s name with the word “cancer” under it? Could she really have cancer? And wasn’t Ellen already using her talents? I looked at Nelson Mandela’s face beaming on my kitchen table. He would have held Ellen’s hand and comforted her in her illness. Writing about talents was still my goal as I sat down to read Mandela’s LIFE Commemorative. I read about a man who fought apartheid and stood trial for treason for his leadership and participation in the Congress Alliance. I read that he encouraged women in their protests, and stayed brave in the face of unjust, unprecedented, 27-years of imprisonment. I discovered a man who created hope with his words, his actions, and his years of incarcerated silence. I also read about Rolihlahla, Mandela’s given name, which translates roughly to “troublemaker”.2 I read about a militant man; a man who learned guerilla warfare; a man who had three wives, one of whom claimed abuse, another who was arrested for murder; a man whose children were raised fatherless, a man whose activities placed him on the US terrorism watch list until 2008, when he was removed by a contrite US government.3 I read about an imperfect man. As I looked again at the photo of Mandela nestled among the celebrity ‘notice-me’ magazines I realized that Matthew’s Parable of Talents, while relevant, is perhaps not the point. Instead, just two Chapters earlier are the words, “Whoever exalts himself will be humbled; but whoever humbles himself will be exalted” (Matthew 23:12). For some, ‘humble’ has taken on a bitter meaning: having … a low estimate of one’s own importance. But I think that the Merriam-Webster online dictionary meaning, which is “not thinking of yourself as better than other people”, is more in line with the message behind Matthew’s words. Now, before you think I am going to slam the celebs for their lack of humbleness, please wait. It is not the celebrities that need to be humbled. For it was I who hypocritically scanned the headlines, hoping no one saw. I believed that Nelson Mandela was too good for the celebrity rack. I judged the people on the magazine covers for misuse of their talents. And it is I who feels gratefully humbled. Nelson Mandela was an imperfect man who helped inspire positive change for his long-suffering people. But what I saw in the LIFE Commemorative was a powerful leader who had grown humble with his years. His humility was evident in his many hugs, his numerous handshakes, his bowed head, his laughing eyes. I no longer believe I need to rescue Nelson Mandela from the tabloid rack. I’m glad his face is surrounded by colorful tabloids that draw the eye. Perhaps there will be others that do a double-take and then select his inspiring story to take home and read. I study the photograph of Mandela surrounded by celebrities. Some, like Ellen, seek to make the world a tiny bit brighter. Others are figuring out how they fit into the world. I think that if Mandela were to find himself sitting among the Miley’s, Bieber’s and Ellen’s of the world, he would extend a hand and listen to their stories. And he would treat them with the dignity and respect that every imperfect person deserves. Ellen Degeneres does not have cancer. LIFE Books, Vol. 13, No. 25, December 13, 2013, 135 West 50th Street, New York, New York 10020. This entry was posted in Faith, Inspiration, Leadership and tagged Bieber, Ellen, Matthew, Miley, Nelson Mandela, Tabloid Rack. Bookmark the permalink.